At last, Nael Zeyara has a steady job in construction, thanks to the smuggling of cement through Gaza's network of tunnels to Egypt, an underground supply line that boosts the Israeli-blockaded enclave and creates jobs. Zeyara, 30, has been out of work for four years. "I lead a tough life with a wife and four children in a rented house," Zeyara told Reuters as he worked. "Six or seven months ago I got my job back when supplies began to flow again," he said. Zeyara earns about $19 a day. Thanks to hundreds of tunnels in the sandy soil of the border zone, a construction boom has buoyed Gaza's otherwise crippled economy, according to a United Nations report. Israel only allows construction materials into Gaza for the use of international relief agencies, including the building of houses and schools. It has recently permitted the import of limited quantities to rebuild some factories destroyed in its largest military offensive in Gaza, in 2009. The UN report said that in an economy severely depressed for most of the past decade developments in the first half of 2011 provided some marginal relief. "Employment jumped by more than 47,000 jobs in first-half 2011, or 24.7%, to an estimated 237,475. The broad unemployment rate declined to 32.9% from 45.2% in second-half 2010," the report said. Gazans say the tunnels have enabled them to bring in all of their needs "from the needle to the rocket." The underground business continues to flourish, undeterred by dozens of deaths from Israeli air strikes or cave-ins, and now far outstrips overland imports from Israel that enter Gaza via carefully supervised official crossing points. "Despite the easing of restrictions on the Israeli-imposed blockade, tight controls of the crossings from Israel into Gaza are a significant factor behind the growth in the tunnel economy," said Chris Gunness, spokesman for the United Nations Relief and Works Agency for Palestinians (UNRWA). UN estimates for the import of building materials in September show that 46,500 tons of aggregate arrived via the Kerem Shalom crossing from Israel into Gaza, whereas 90,000 tons came through the tunnels. Some 9,195 tons of cement came through Kerem Shalom, against 90,000 through the tunnels. For steel rods, 1,418 tons transited Kerem Shalom versus 15,000 via the underground route. UNRWA says Gaza's jobless rate is still one of the most severe in the world and a "reversal of deepening poverty and aid dependency among ordinary people in Gaza is unlikely." About 1.7 million Palestinians are estimated to live in the narrow coastal enclave, a strip of land along the Mediterranean Sea between southern Israel and Egypt's Sinai border. It is controlled by the Islamist movement Hamas, which is considered a terrorist organization by Israel and the West. The Hamas administration says many factories that had closed doors in 2007, when Israel tightened its blockade after Hamas seized Gaza from forces loyal to President Mahmoud Abbas, have now re-opened and re-hired their employees. "The more building increases, the bigger the number of people who will join the labor force," said contractor Majed Sabra, supervising at team of 10 at a construction site. Israel restricts the import by Gaza of construction materials such as cement and steel, which it says could be used for military purposes by Gaza's armed factions. Hamas and Islamic Jihad have used the tunnels to import rockets which are fired sporadically into Israel. Nevertheless, construction seems to be going on in every street. New roads have been paved, others are under construction and modest shopping malls have been inaugurated using private and Hamas money. UNRWA acknowledges Gaza's "expanded activity due to the tunnel economy" but says the situation of about half a million Palestinian refugees in the territory remains a concern. UN and Palestinian officials say Gaza will not see real progress without freedom to export. Israel allows limited exports from Gaza at the peak season for cut flowers and strawberries, shipped fresh to Europe. The flow of building materials also has a social impact. "I have built some houses for people whose marriages had been delayed because they could not build a house or expand the building at their family home," said Sabra, 42. Hussam Breika, a businessman, he and his brothers were building a large home to unite them all under one roof, as Gazans traditionally live. "Right now, each brother lives in a different area of Gaza. A family house is different. Family ties get stronger," said Breika, who imports food products and soft drinks via Israel. 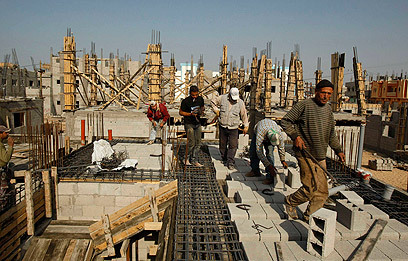 See all talkbacks "Gaza's tunnels unleash building boom"